Your Pinterest feed may be inspiring you to design your next building project with recycled timber doors or timber window frames. They can look stunning, but for how long and is this fast track to aged or stressed wood pocked with pitfalls? We’ll bore into some of the issues you may need to consider. Chances are you’d be quite discerning about sourcing your timbers. Salvage yards may have differing standards so you could be a victim to false labelling. Would you risk your project on a lucky dip when it comes to sourcing wood? Is the wood you’ve ordered, the wood you want and need? For example, the wrong type used for external features such as window frames could warp, shrink, deteriorate and rot. You need to be confident that the claims such as stress grade, species and state of seasoning (moisture levels) meet the guidelines of the NSW Office of Environment & Heritage and the Timber Development Association. When you’re taking the time to create a bespoke project, only quality timber that you can verify will do. Recycled timber could introduce pests such as termites or borers onto your building site. So, if you’re going for a timber frame as well as timber doors and timber window frames, introducing reclaimed wood could lead to massive structural issues down the road. Sure, you can plane the wood down to remove any borers’ holes, but have you missed any? The wood could also be harbouring mould and mildew. That was the case for timber used in a supermarket display. Little did the owners know that the wood had been reclaimed after it had been downed in a hurricane, as this article shows. Black mould is particularly nasty. We’ve also seen mould – even a strange species of mushroom – grow on recycled wood on the inside of a south-facing window frame in a 1970s’ apartment block. Quirky, but perhaps not a good sign for how healthy that room was for the inhabitants. Timber that had a former life in a barn or shed with animals might be carrying a bacterial load from their faeces. You’d want to be sure that that burden has been eliminated from the reclaimed wood you’re sourcing. A side order of chemicals and nasties with that? Think about what chemicals the animals may have been exposed to and whether the wood may have been inadvertently sprayed or come into contact with that. Can you guarantee that’s disappeared? 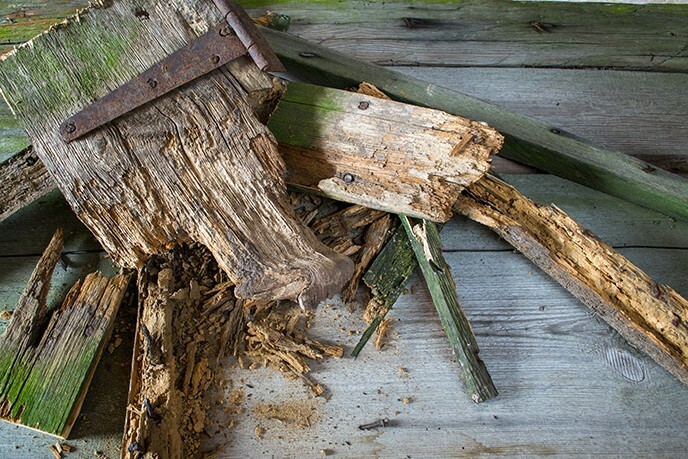 As well, past approaches to fend off woodborers, termites and other wood pests may have left a legacy of dangerous and possibly carcinogenic chemicals such as creosote or Pentachlorophenol on your prized piece of recycled wood. You may not be thinking to use railways sleepers for your building project, as they’re likely to have fine particles of asbestos from the train brakes of old. While trains haven’t used asbestos in their brakes since 1985, those fibres could be trapped in the cracks on the sleeper’s surface. And another nasty. Just say the timber has been reclaimed from another building. If it was pre-1978, it may still have lead paint. You’d know as that paint deteriorates, or even as you cut and sand it, it releases fine lead dust that can be inhaled, or settle on the soil leading to elevated lead levels in human blood. When you steer away from recycled timber, you’ve got more control over how the wood ages. Reclaimed wood has already been through the ageing process. When you use new timber in your building project, your client will be able to enjoy the experience as the wood ages over time. They’ll grow with it, so to speak. You’ll also have more confidence that the ageing will be consistent. How sustainable is recycled really? Pre-loved wood will typically have bolt holes and nail holes that will need to be filled before you can repurpose them for another building project. Usually, they’re filled with 2pac epoxy resin, which isn’t very eco-friendly. If you’re aiming for something eco-sustainable, new timber has a lot fewer ‘grey’ areas than recycled wood. So, the pitfalls of reclaimed wood – working out provenance, price, toxins, pests – can be many. It may not be the best fit for your project. Like some inspiration? Check out Acacia Joinery’s gallery of residential projects.